The color of curiosity. The color of confidence. The color that most catches the human eye. Yellow is these things and so much more. So, what does the color Yellow mean to you? 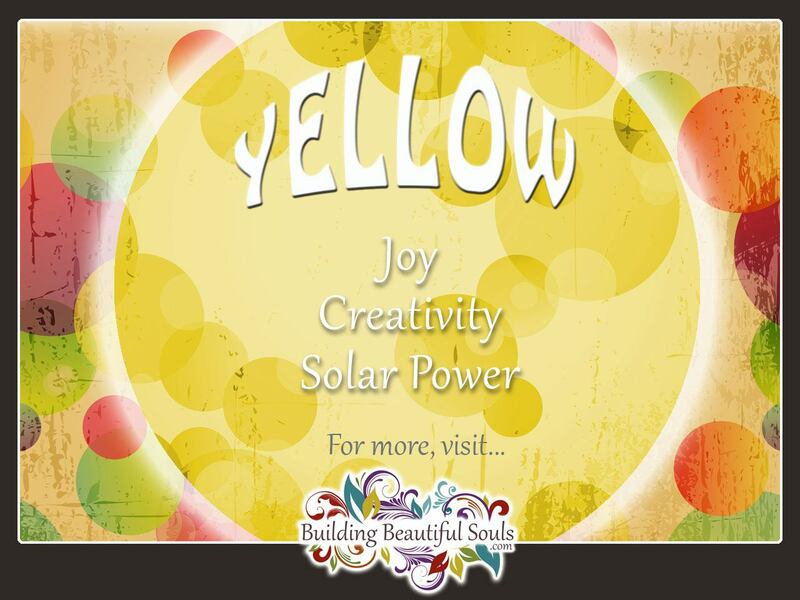 Why did Yellow guide you to BuildingBeautifulSouls.com? The symbolism and meaning of the color Yellow depends heavily on context. There is one nearly universal association, however, and that it is the color of the sun. Physically speaking, Yellow is a fantastic color that inspires joy while also activating our logical thinking processes. Yellow literally shines a light on the sluggish or stalled areas of thought. There has been some speculation that bright Yellow is too energetic for babies, but that has been shown to be a myth. In fact, a developing child can benefit intellectually from Yellow highlights. Did you know that Yellow is the color we see quicker than any other? This is why you see Yellow in various types of advertising. People who favor Yellow have sunny dispositions and a love for old-fashioned fun. Yellow people love to create, manifesting your inventive ideas in the most perfect way possible. That means you might be a little harder on yourself that others. Yellow is innately curious about everything – every detail. This leads to a cautious personality, except when you’re feeling anxious and then just get out of your way! Independence is the name of the game with Yellow. While you like social settings crowds aren’t your thing. A small circle of friends and family is all you need for happiness. Yellow’s communication skills are well-honed but for when they get angry and then words fly like daggers. Yellow people are more mindful than physical. They make excellent analysts, journalists, scientists or any other career that requires a keen mind. Yellow has a passion for gadgets – anything new and clever grabs your attention. This may be true spiritually too – that new Tarot deck looked tempting! If you need a networker – find a Yellow person. They can talk about nearly anything from fashion to the hardest crossword puzzles. Generally speaking if yellow is your favorite color you like order. All things in their place is Yellow’s mantra. Chaos disrupts your creational vibes to the point of distraction. Yellow harmonizes with your left mind, which also improves your perception. When you want to truly express yourself clearly, yellow is a go-to color. Practicality, realism and level-headedness are all characteristics of the Yellow person. Better still, you can inspire confidence in the people around you because they trust your input. Note that all this thinking does not make Joe or Jill dull – just the opposite. Yellow has a quick wit and charming personality. Surrounding yourself with Yellow supports fresh ways of looking at things. When your mind feels fuzzy or you have to make fast decisions wear Yellow. This hue is not recommended, however, for people with high anxiety or stress in their lives (especially bright Yellow). Yellow is a “mental” color vs. emotional. When you feel everything too intensely add yellow into your surroundings, perhaps in the form of sacred stones like amber, citrine and golden beryl. You can also carry these with you as a Yellow-themed talisman. Pale Yellow has a rather youthful feel to it. There’s a sense of innocence and pleasure that comes from this color. Pale yellow is an excellent choice for kitchens. Feng Shui tells us to also use Yellow in areas that don’t receive a lot of sunlight. Intense yellow will wake you up as sure as a cup of coffee! Its interesting to note that horror films use the negative symbols and associations for Yellow to highlight intense moments. Yellow eyes and sickly Yellow skin are two examples. Psychologically this makes sense because it is not a normal color to our bodies and actually signals sickness like Jaundice. Use pale Yellow for alertness, lemon Yellow for self-assurance and methodical action, golden Yellow for investigating a person or situation in great detail, and creamy Yellow for inventiveness. Amber peace, preservation, protection for children. Honey Calcite – balances through times of change, promotes patience. Yellow Jade – luck, good fortune, sunny days. Mookaite Jasper adventure, slows aging, aids in decision making. Pyrite – blocks energy depletion, deflects negativity, promotes high energy. Golden Healer Quartz universal life force, raise vibration, facilitate communication between worlds. Yellow Sapphire – July birthstone, Taurus zodiac sign, wisdom. Yellow Carnation – disappointment, rejection. Daffodil – soulmates, the sun always shines on you. Yellow Gerbera Daisy – youth, innocence, zest for life. (Gold) Yellow Lotus Flower – enlightenment, nirvana, pure love. Marigold – creativity, blissful relationships, warmth in the soul. Yellow Rose – passion, joyous love, new beginnings. Black Eyed Susan – encouragement, from darkness into the light. Sunflower family ties, pure bliss, psychic power. Yellow Zinnia – fond memories.